A prominent piece of Facebook real estate is dedicated today to helping hundreds of thousands who've been displaced, wounded or otherwise affected by Nepal's 7.8-magnitude earthquake. Users will find a "Donate Now" button atop their news feeds, similar to the social networking giant's option to help contribute to ebola containment and treatment efforts in November 2014. However, unlike that effort, which sparked some complaints of Facebook putting the onus of donations on users, the social network is now specifying that it will match $2 million in contributions. Clicking the button (or donating via Facebook's Nepal recovery landing page) will pop up options of contributing $10, $25, $50, $100 or a custom amount to the International Medical Corps, which is operating mobile medical units to treat the critically wounded and dispense medicine. "Together we can help urgent care reach the people who need it," Facebook CEO Mark Zuckerberg wrote on his personal wall. "Thinking of all of you who are there and all of you who have relatives and friends in the affected areas." 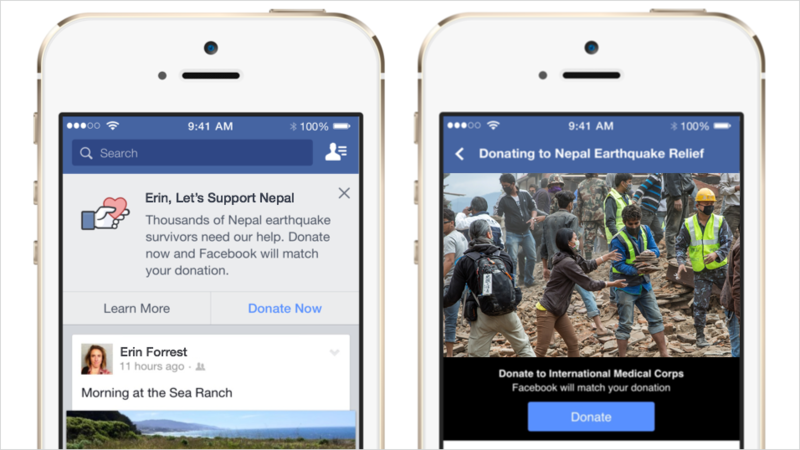 The donation button isn't Facebook's first response to the disaster. Shortly after the initial earthquake, Facebook activated its Safety Check app to help residents of the region confirm that loved ones were alive. The Saturday earthquake's death toll continues to rise, surpassing 5,000 and almost certain to keep climbing as the impact on the mountainous region becomes more clear. Experts on the region say the impact of the quake and its terrifying aftershocks has been exarcerbated by political chaos and inefficiency since the nation's monarchy was abolished in 2006 after a decade-long civil war waged by Maoist rebels.